Gov. Rod Blagojevich insists he will be vindicated. (CNN) -- Former Illinois Gov. Rod Blagojevich said Sunday that he is not ruling out a return to politics once the legal process against him winds down. "My adult life was serving the people as a congressman, as a governor. It's what I know," Blagojevich said on "Fox News Sunday." "I'm not ruling myself out as coming back, because I will be vindicated in this case. I'm significantly closer to vindication than I ever was." 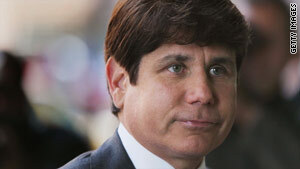 Video: What's next for Blagojevich? The former governor said the fact that he didn't present a defense in the first trial and was not found guilty on the corruption charges showed that the government lacked the evidence that he did anything wrong. In the second trial, Blagojevich said he would mount a defense that would include calling players such as White House Chief of Staff Rahm Emanuel and Sens. Harry Reid and Robert Menendez to the stand. "I'm ready for Round 2," he said.